The opening round of the 2014 World Superbike Championship provided starving racing fans with some much needed excitement as Eugene Laverty and Sylvain Guintoli each shared a victory a piece in the opening round at Phillip Island. For the debuting Voltcom Crescent Suzuki rider there was no better start to his season after he charged from a bad start that found him fighting mid-pack to then take a resounding win in race 1 and the first victory for Suzuki since Kyalami in 2010. Laverty challenged the factory Aprilia riders and thumbed his nose at the Italian manufacturer who let him go at the end of last season to replace him with Marco Melandri, as the Italian finished third behind his team mate Sylvain Guintoli. Guintoli grabbed the holeshot from the pole position and led the first part of the 22-lap race dragging behind him his teammate Melandri and Ducati’s Davide Giugliano, as the three immediately broke away from the rest of the pack . While Laverty had his work cut out for as he was caught up in a tight and aggressive five-way battle for fourth with Loris Baz, Jonathan Rea, Chaz Davies,and Tom Sykes. However the Northern Irishman managed to shake off the battling group and immediately began chasing and closing the gap on the frontrunners. Giugliano in the meantime had been biding his time, nosing around Melandri tail and on lap 13, at the Honda Hairpin, the Ducatista finally made the move passing Melandri and then it was Laverty’s turn to pass the Aprilia rider at Siberia dropping him to fourth. Melandri would make the same move on Giugliano on the following lap. With six laps to go Laverty pushed ahead of Guintoli at the Doohan Corner and started to pull away from his former team-mate. With three laps the Suzuki had already put 1.6 second between himself and would then cruise to victory with a three second advantage ahead of the duelling Aprilia duo of Guintoli and Melandri. The Frenchman had his hands full with his teammate and with two laps left of the race, Melandri took secondin his first race on the Aprilia leaving a disappointed Guintoli in third. Giugliano brought his Ducati home in a solid fourth, despite struggling with his tires. The battle for fifth would go to Kawasaki’s Loris Baz, followed by Jonathan Rea on the Pata Honda, and reigning World champion Tom Sykes. Eighth place went to Chaz Davies, who set the fastest lap of the race with the Ducati Panigale, while an excellent ninth place went to David Salom on the Kawasaki EVO machine. Rounding out the top-10 was Ducati’s Niccolo Canepa on the Panigale EVO. 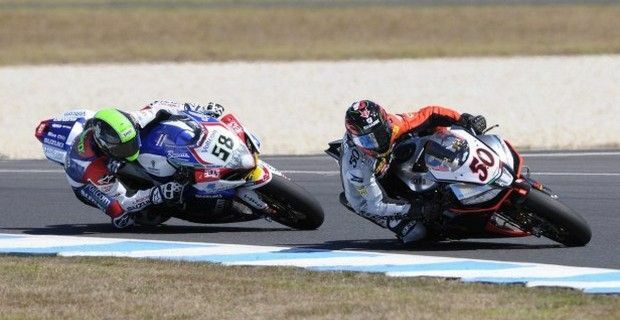 Making up for his third place in Race 1, Aprilia’s Sylvain Guintoli took a dominant win in the second World Superbike race at Phillip Island, that was shortened by seven laps due to Eugene Laverty’s engine blowing –causing the red flag to come out and stopping the race. Kawasaki duo of Loris Baz and Tom Sykes completed the podium with the reigning champion finishing in third after being muscled out by his team mate on the second lap dropping him to eighth and forcing him to push through the field. It was a highly battled race in the first corners as Marco Melandri took the holeshot in front of Davide Giugliano and Guintoli, but the Frenchman grabbed the head of the race in lap two as Melandri ran wide which let a hard charging Loris Baz go into third, followed by Pata Honda’s Jonathan Rea and Eugene Laverty. On lap seven Guintoli would find himself bumped down to second place as Baz moved into the lead at turn two, which then allowed both Laverty and Rea to pounce demoting the Aprilia man to fourth. On lap eight Laverty would push past Baz and for the next four laps would retain the lead where he would remain until lap 12 as Guintoli regained his momentum passing first Rea, then Baz and finally Laverty during the fourteenth lap. The pass would prove crucial for the final results as the Frenchman led into lap 15, when Laverty's Suzuki suddenly blew a tremendous amount of white smoke, forcing the red flag to be deployed. With Laverty out of the contention Baz would finish in second ahead of defending World champion and team mate Tom Sykes who managed to get to third place after intense battles with other British riders. Giugliano took home another fourth place, ahead of Pata Honda duo Jonathan Rea and Leon Haslam, while Ducati's Chaz Davies ended up in seventh. Too many errors left Marco Melandri down in eighth position, ahead of satellite Aprilia rider Toni Elias, while David Salom closed out the top ten with his Kawasaki EVO machine.